The average annual surface air temperature anomaly over land north of 60° N for October 2016-September 2017 was the second highest (after 2015-2016), in the observational record beginning in 1900. Extreme Arctic-wide air high temperatures were observed in autumn 2016 (October-December); extensive regions over the central Arctic showed anomalies exceeding +5° C. These conditions were primarily due to southerly winds moving warm air into the Arctic from the mid-latitude Pacific and Atlantic oceans. Neutral temperature anomalies occurred across the central Arctic Ocean with weak sea level pressure gradients. Like summer 2016, summer 2017 weather conditions did not support rapid summer sea ice and ice sheet loss. Arctic surface air temperature is an indicator of regional and global climate change. Although there are year-to-year and regional differences in air temperatures due to natural variability, the magnitude and Arctic-wide character of the long-term temperature increase is a major indicator of global warming and the influence of increases in greenhouse gases (Overland, 2009; Notz and Stroeve, 2016). We report on the spatial and temporal variability of Arctic air temperatures during the period October 2016 through September 2017, the 12-month period since the end of the previous reporting period in Arctic Report Card 2016. After a very warm autumn across the Arctic 2016 and a warm winter on the Asian side, spring and summer 2017 had near-average air temperatures relative to the 1981-2010 climatology. Spring and summer 2017 temperatures were reminiscent of conditions (see essay on Terrestrial Snow Cover) before the long-term temperatures increases that began in the 1990s. The impact of the 2017 spring and summer conditions is seen throughout the contributions in Arctic Report Card 2017. For instance, there was more snow in spring and less sea ice and ice sheet melt in summer. The 2017 fire season was not unusual. Unlike many recent years of the previous decade, where high sea level pressure dominated the Arctic region, weak low pressure systems were observed in spring and summer 2017. The latter is more consistent with atmospheric and wind forcing patterns typically observed prior to 2007 (Overland et al., 2017), and runs counter to the conditions driving the longer-term trends reported throughout Arctic Report Card 2017. At +1.6° C, the mean annual surface air temperature (SAT) anomaly for October 2016-September 2017 for land stations north of 60° N is the second highest value (after 2016) in the record starting in 1900 (Fig. 1). Currently, the Arctic is warming at more than twice the rate of global mean temperatures (Fig. 1). The greater rate of Arctic temperature increase, compared to the global mean increase, is referred to as Arctic Amplification. Mechanisms for Arctic Amplification include: reduced summer albedo, due to sea ice and snow cover loss; the increase of total water vapor content in the Arctic atmosphere; a summer decrease and winter increase in total cloudiness (Makshtas et al., 2011; Lenaerts et al., 2017); the additional heat generated by newly sea-ice free ocean areas that are maintained later into the autumn (Serreze and Barry, 2011); and the lower rate of heat loss to space in the Arctic relative to the subtropics, due to lower mean surface temperatures in the Arctic (Pithan and Mauritsen, 2014). Arctic warming has also been influenced by past air pollution reductions in Europe (Acosta Navarro et al., 2016). Seasonal air temperature variations are divided into autumn 2016 (October, November, December [OND]), and winter (January, February, March [JFM]), spring (April, May, June [AMJ]), and summer (July, August, September [JAS]) of 2017. These seasonal SAT divisions are chosen to coincide with the seasonal cycles of key Arctic variables: summer sea ice minimum occurs in September and autumn cooling continues through December. Fig. 2. 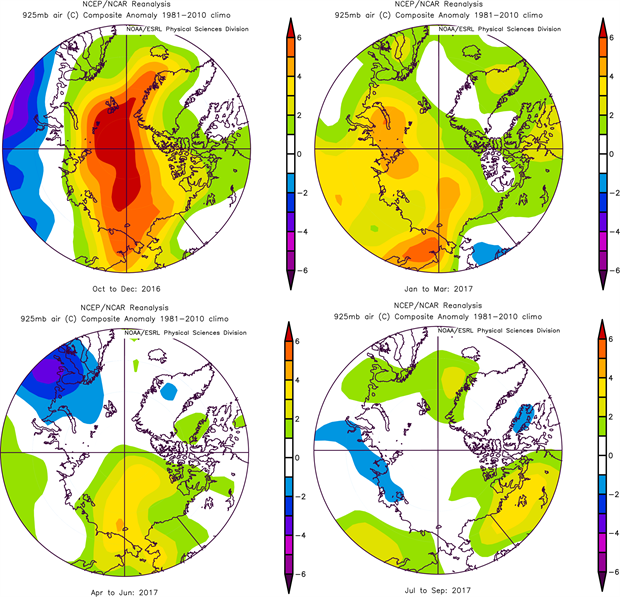 Seasonal anomaly patterns for near-surface air temperatures (in °C) relative to the baseline period 1981-2010 in autumn 2016 (top left), winter 2017 (top right), spring 2017 (bottom left), and summer 2017 (bottom right). Temperature anomalies are from slightly above the surface layer (at 925 mb level) to emphasize large spatial patterns rather than local features. Data for this and the following figures are from NOAA/ESRL, Boulder, CO, at https://www.esrl.noaa.gov/psd/. Autumn 2016 (OND). A broad swath of extreme warm temperature anomalies (> +5° C) stretched across the central Arctic (Fig. 2a). The warmest temperature extremes, north of Bering Strait and near the North Pole, were due to advection of warm air from the south from the Pacific and Atlantic oceans (see Arctic and Mid-latitudes Connections, below). Svalbard Airport reported an all-time high monthly average for October (+3.2°C; 1.8° above the previous record from year 2000). Iceland was also notably mild, while Greenland coastal temperatures were unexceptional. Warm temperature anomalies in Alaska led to a late start to winter snow pack (see essay on Terrestrial Snow Cover). Winter 2017 (JFM). Most of the remaining year from January through September was uneventful in terms of major features on a seasonal basis (Fig. 2b-d). There were, however, notable short term, regional temperature anomalies in response to highly variable jet stream shapes. For instance, Iceland experienced a record high maximum temperature for February (Trausti Jonsson, Icelandic Met Office, pers. comm.). March 2017 had major warmth across Siberia (Fig 3) including east Asia. Even though Arctic-mid-latitude weather connections are hypothesized for eastern Asia due to loss of sea ice the Kara-Barents Sea (Kim et al., 2014) there were no severe cold storms in Asia during the 2017 winter. Spring 2017 (AMJ). Spring (Fig. 2c) showed some warm temperature anomalies in the East Siberian Sea, a continuation of the warm feature observed in March. This regional warming supported early sea ice loss in the Chukchi Sea (see essay on Sea Ice). 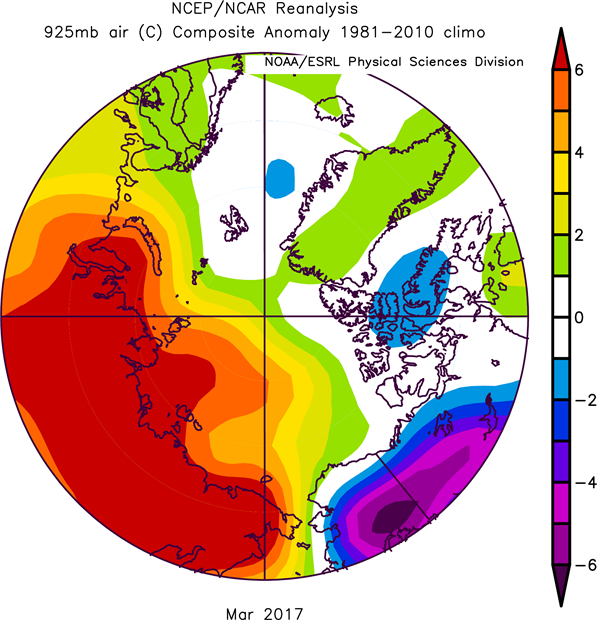 May saw anomalous high pressure extend between Greenland and Norway, with relatively warm but unexceptional temperatures over Greenland, and the warmest May for 25 years over the UK. Summer 2017 (JAS). Like Summer 2016, Summer 2017 contrasted with warm conditions in much of the previous decade (Fig. 2d). Neutral anomalies occurred across the central Arctic in summer 2017, which did not support continued overall rapid summer sea ice loss (see essay on Sea Ice). Mean coastal Greenland temperatures were near climatological levels, in contrast to some summers in the recent decade. Alaska/northwestern Canada was the only region with above average summer SAT. Several locations in the interior of Alaska had the warmest calendar month of record in July, yet Alaska had a normal wildfire season overall (see essay on Wildfires). Many stations in the north and east of Iceland recorded record temperatures for September. Fig. 3. March 2017 air temperatures with extremes over Siberia. Source: https://www.esrl.noaa.gov/psd/. Like winter 2016, warm temperature conditions in the Arctic in autumn 2016 were primarily a response to southerly winds advecting warm air into the Arctic from mid-latitudes. The positive near-surface air temperature anomalies were associated with a persistent pattern in the geopotential height field characterized by low values west of Greenland and over eastern Siberia and higher values in the central Arctic (Fig. 4a). Winds tend to follow the contours of geopotential heights counter-clockwise around low values. Consequently, warm air over the northeast Pacific Ocean was advected into and across Alaska and the seas north of Alaska and eastern Russia. Warm southerly winds from the North Atlantic also extended across the central Arctic past the North Pole (i.e., follow purple contours in Fig. 4a), providing the primary atmospheric source of anomalous warmth over much of the Arctic Ocean. Normally there is a single large Arctic region of low geopotential heights, which establish a tropospheric polar vortex (see, for example, Overland et al., 2015). In Autumn 2016 higher geopotential heights in the central Arctic split the polar vortex into two pieces. The persistence of warm Arctic temperatures into the late autumn was in part caused by a positive feedback, where advection of warm air temperatures and delay of autumn freeze-up of sea ice contributed to increasing the temperatures and the geopotential heights over the central Arctic, which in turn helped to maintain the unusual 2016 wind pattern. 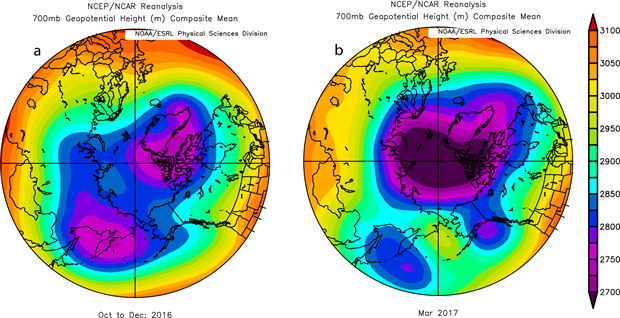 After December 2016 the tropospheric polar vortex, as shown by the geopotential height field, varied considerably by month and region. For example, the height field for March (Fig 4b), which supported a warm Siberia by advecting warm air from the Atlantic Ocean region (Fig 3), has an entirely different shape than it did in autumn (Fig 4a). 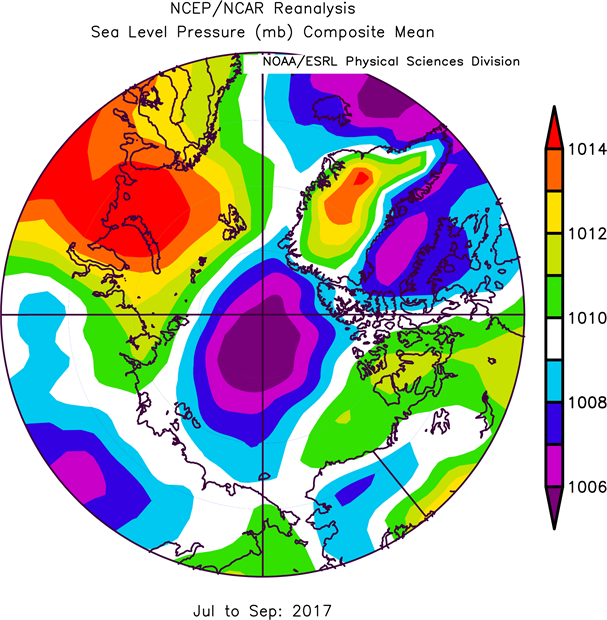 Summer sea level pressure (Fig 5) was characterized by low pressures in the central Arctic. This pattern prevented extra heat from mid-latitudes from penetrating into the central Arctic and differed from low sea-ice summers. This pressure pattern was accompanied by widespread cloud cover as seen in satellite observations that limited the solar heating of the lower atmosphere in the central Arctic. These conditions are likely to have contributed to a slowing of the sea ice loss in summer 2017 (see essay on Sea Ice). Fig. 4a. Geopotential height (700 mb) from October-December 2016. The normally continuous tropospheric polar vortex of low heights (purple shading) over the central Arctic was split in two parts in autumn 2016, similar to winter 2016 (see 2016 Arctic Report Card). The jet stream is located where the gradient in the geopotential height is large. This pattern gives rise to southerly winds and extreme record temperatures over the central Arctic. Fig. 4b. Geopotential height field for March 2017 showing a different tropospheric jet stream structure (dark blue contours) than autumn 2016 (Fig. 4a). Fig. 5. Sea level pressure field for summer 2017. Acosta Navarro, J. C., et al., 2016: Amplification of Arctic warming by past air pollution reductions in Europe. Nature Geosci., 9, 277-281. Kim, B. -M., S. -W. Son, S. -K. Min, J. -H. Jeong, S. -J. Kim, X. Zhang, T Shim, and J. -H. Yoon, 2014: Weakening of the stratospheric polar vortex by Arctic sea-ice loss. Nat. Commun., 5, 4646, doi:10.1038/ncomms5646. Lenaerts, J. T. M., K. Van Tricht, S. Lhermitte, and T. S. L'Ecuyer, 2017: Polar clouds and radiation in satellite observations, reanalyses and climate models. Geophys. Res. Lett., 44, 3355-3364, doi: 10.1002/2016GL072242. Makshtas, A. P., I. I. Bolshakova, R. M. Gun, O. L. Jukova, N. E. Ivanov, and S. V. Shutilin, 2011: Climate of the Hydrometeorological Observatory Tiksi region. In Meteorological and Geophysical Investigations. Paulsen, 2011, 49-74. Overland, J. E., 2009: The case for global warming in the Arctic. In: Influence of Climate Change on the Changing Arctic and Sub-Arctic Conditions, J. C. J. Nihoul and A. G. Kostianoy (eds. ), Springer, 13-23. Overland, J. E., E. Hanna, I. Hanssen-Bauer, B. -M. Kim, S. -J. Kim, J. Walsh, M. Wang, and U. Bhatt, 2015: Air Temperature. In: Arctic Report Card: Update for 2015, ftp://ftp.oar.noaa.gov/arctic/documents/ArcticReportCard_full_report2015.pdf. Overland, J. E., M. Wang, and T. J. Ballinger, 2017: Recent Increased Warming of the Alaskan Marine Arctic Due to Mid-latitude Linkages. Adv. Atmos. Sci., 35, doi: 10.1007/s00376-017-7026-1. Pithan, F., and T. Mauritsen, 2014: Arctic amplification dominated by temperature feedbacks in contemporary climate models. Nature Geosci., 7, 181-184, doi: 10.1038/ngeo2071. Serreze, M., and R. Barry, 2011: Processes and impacts of Arctic amplification: A research synthesis. Global Planet. Change, 77, 85-96.